California sea lions are probably the most familiar pinniped because they are often seen in zoos and aquariums. In the wild, they are found in the North Pacific. They form large social groups during the late spring and summer breeding season on islands off southern California and Baja California, and on islands in the Gulf of California. It is believed that females and juveniles remain near the rookeries year-round, but males migrate north as far as British Columbia during the fall and winter. 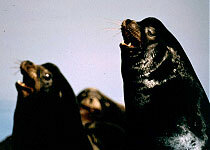 California sea lions feed on more than 50 species of fishes and cephalopods. Coloring and size varies between the male and female of this species. The males are chocolate brown and weigh up to 450 kg (1000 lbs). Females are a lighter brown and weigh up to 100 kg (220 lbs).California sea lions use underwater calls to establish and defend territories and establish dominance during the breeding season. Their underwater calls include barks, whines and buzzing sounds, and click trains. California sea lions also produce many more calls when they are in the water with their heads above the surface. Some of these calls are transmitted into the water. 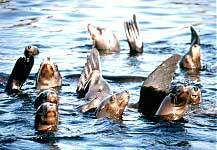 Calls are also produced when sea lions are out of the water on their terrestrial rookeries. Males bark profusely when defending their space and during mating. Female sea lions bark, squeal, belch, and growl when their pups are in danger. The females and pups are able to recognize each other’s individual calls.